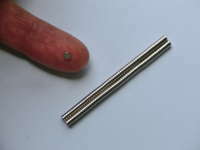 DangerousMagnets - C0301___Diam 3 mm x 1mm. N52. Qty120 for sale! • 3mm diameter x 1mm thick. • Pull/Push: About 130 grams to another magnet or to 0.4mm sheet steel. Resistance to sliding is about 1/3 that. Stack 2 for twice the pull. • One magnet holds one (actually 2 - just) A4 sheet on a whiteboard. But for easier-to-handle magnets on whiteboards, I recommend my D6x6mm in pairs, or similar. • Warhammer etc. Attaching parts of models or for movement trays.